When I was growing up my mother often made sheet cake when she needed to feed a crowd. They were either yellow cakes with pudding, pineapple, and cream or else chocolate with pudding, cherries, and cream. 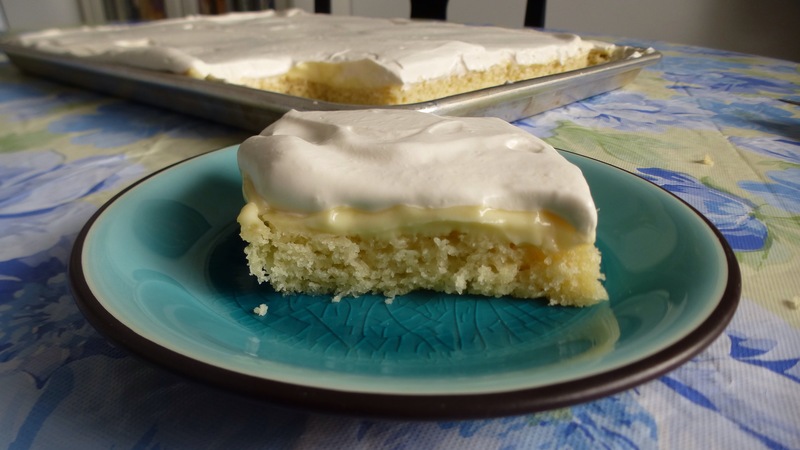 This lemon sheet cake has just the right balance of lemon; it isn’t overpowering but the citrus flavor comes through. You can easily adapt this recipe by substituting orange or lime for lemon. I love the thin layer of lemon custard. The custard can also be used for a fruit tart, trifle, or a lemon custard pie or crostata. The recipe is inspired from one shared by our friend Jack. For the cake: Preheat oven to 350 degrees. Spray a jelly roll pan and line with parchment. In a mixing bowl beat butter and sugar until light and fluffy, 4-5 minutes. Add lemon zest and eggs one at a time. Scrape down the sides of the bowl. Add yogurt and buttermilk. Mix. Add lemon juice, lemon oil, and vanilla. Sift together the flour, baking powder, baking soda, and salt. Slowly add dry ingredients to wet. Don’t over mix. Pour into prepared pan and bake for 15-20 minutes until an inserted toothpick comes out clean. Cool on rack. For the custard: In a 2-quart saucepan combine milk, cream, 1/2 cup of the sugar, lemon zest, and salt. Turn heat to medium low and bring to a simmer. In a separate bowl whisk together eggs, 1/4 cup sugar, cornstarch, and lemon juice. Whisk about 3/4 cup hot milk mixture into the egg mixture. Whisk egg mixture back into hot milk and continue cooking, whisking constantly until custard thickens, about 5 minutes. Remove from heat and add vanilla. Pour custard into a bowl. Place plastic wrap directly on custard and chill until cold. Assembly: Spread cooled custard on lemon cake. Whip cream with confectioners sugar and vanilla until thick. Spread over custard. Serves 18. This entry was posted in Cakes, Custards, Desserts, Easter. Bookmark the permalink.